Fourth of July celebrations abound in the Carson City area. Fireworks can be found in Carson City, Virginia City, Reno, Sparks, and at both north and south shore of Lake Tahoe. There are several daytime events going on beginning this weekend, so grab the kids, your friends and family, and have a great Independence Day week! Please be safe, have a designated driver or ride handy, and remember that this whole area is just a fire waiting to happen – fireworks of any type are illegal and completely ill-advised. Time is a precious commodity. Once it’s gone, we can’t get it back. It won’t be quite as hot today, but it’s definitely summertime. The Library is still a great bet for all ages. Family story time happens every Thursday morning, with Lego Club offered Thursday afternoons. Shine up the chrome and head to Buffalo Wild Wings for the weekly summer cruise night. Sassafras Eclectic Food Joint is a great place for music, food, and friends: they’ll be featuring Little Mazarn on the stage tonight as the Texas group swings through the area on their cross-country tour. Reno Aces slugger Kevin Cron connected three times in a 14-4 thrashing of the Salt Lake Bees on Wednesday night. Welcome to Wednesday, Carson City. Break up the work week with some time out with friends. Try DJ Trivia at Bella Fiore; even though it’s a wine shop, the game is open to all-ages. Wine, Beer and Bowl at Carson Lanes is a fun way to break routine. Kids will love the Wildlife Show at the CVIC Hall in Minden; just get there early for a good seat. Take a trip back in time at the Dangberg Home Ranch Historic Park. The Young Chautauquans will bring notable Nevadans like Charley Parkhurst and Abe Curry to life. It’s been toasty outside, which is one of the reasons Muscle Powered moves the start time for their morning walk during the summer months. A stroll along the Carson River at Riverview Park is a perfect way to start the day. If your little one is still a little uneasy on a bicycle, the Bike Safety Rodeo in Silver City will help get them on the right path. Tuesdays belong to Canyon White at Living the Good Life. The singer/songwriter takes to the stage for a jam session and open mic night. 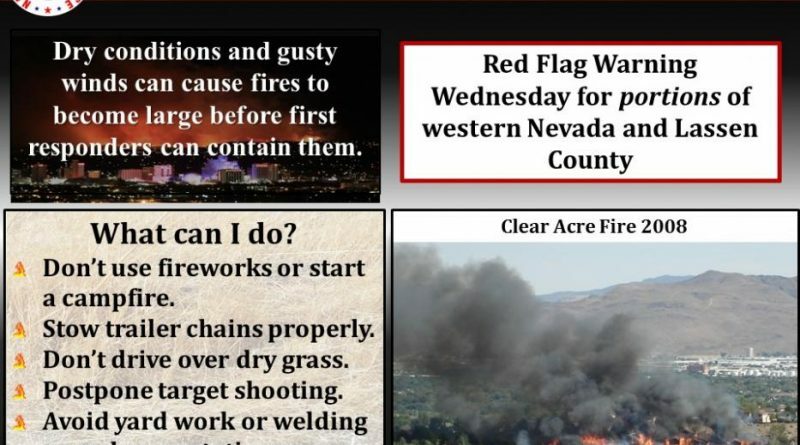 The hot and very dry weather will continue through Wednesday around the Carson City region, with stronger winds Monday afternoon as low pressure passes toward the north, prompting the National Weather Service to issue a Red Flag fire weather warning.